Xiaomi Redmi 6 Pro has now been teased with an option to hide its display notch. A formal teaser has confirmed the new development, which brings the Redmi 6 Pro in line with the Huawei P20 Lite, Nokia X6, and OnePlus 6 that all include the feature to hide the notch design by bringing a virtual bezel to the top of the display panel. Separately, the official Redmi Weibo account has shared a new publication’s post wit photos detailing the unboxing of the upcoming Redmi 6 Series handset. The handset is set to debut in China on June 25, alongside the Mi Pad 4, and is so far officially teased to have a display notch, dual rear camera setup, rear-facing fingerprint sensor, and multiple colour options. Additionally, different RAM and storage variants of the Redmi model have been leaked online. 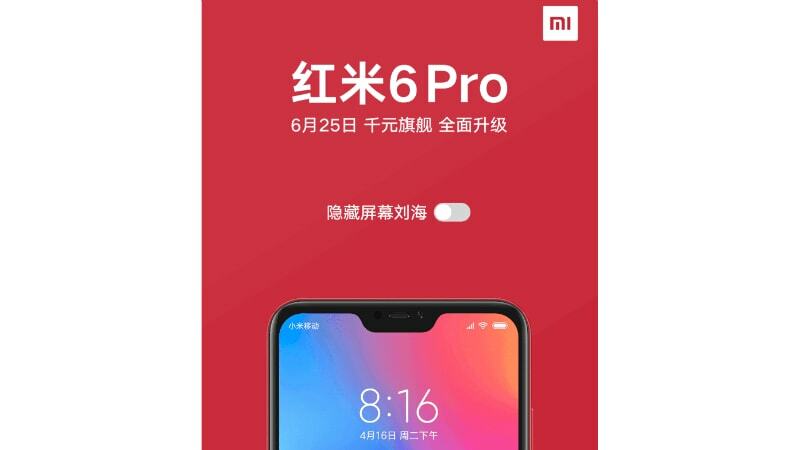 The official teaser posted by Xiaomi’s official Redmi Weibo accounts has revealed that the Redmi 6 Pro will come with an option to hide its display notch. This will be of great help for users who don’t want to have the iPhone X-like notch on their device. As we mentioned, models such as Huawei P20 Lite, Nokia X6, and OnePlus 6 already have the option to hide their notch. These models essentially add a black strip on top of the the status bar area to hide the notch. Notably, the Nokia X6 received the new optionthrough a software update. In addition to the teaser, the official Redmi Weibo account has shared a post by Chinese news site IT168, confirming the authenticity of photos showing the unboxing of the Redmi 6 Pro. The photos show the handset live, alongside a clear TPU case, travel adapter, and a USB cable. The handset featured in the photos comes in a Rose Gold colour option and has a metal-finish back panel. Moreover, the design of the Redmi model appears to be quite similar to the Redmi Note 5 Pro that was launched in India back in February. Alongside showing it live, the same Weibo post by IT168 reveals that the Redmi 6 Pro with 4GB RAM and 64GB onboard storage will come with a price tag of CNY 999 (approximately Rs. 10,400). This is notably identical to the 3GB RAM variant of the Redmi S2. Apart from the official revelations, Twitter user Ishan Agarwal has leaked an image showing the different RAM and storage variants of the Redmi 6 Pro. It has been spotted that the handset will come in configurations, including 3GB RAM and 32GB storage, 4GB RAM and 32GB storage, and 4GB RAM and 64GB storage. This is unlike the originally spotted TENAA listing that revealed the handset in 2GB, 3GB, and 4GB RAM along with 16GB, 32GB, and 64GB of onboard storage options, respectively. Some previous reports claimed that the Redmi 6 Pro will come with a 5.84-inch full-HD+ display with a 19:9 aspect ratio and sport a 12-megapixel primary sensor at the back and a 5-megapixel camera sensor at the front. The smartphone is likely to run Android 8.1 Oreo on top of MIUI 9, though it could receive MIUI 10 update sometime following the launch.